Designed with the low-power AMD G-Series APU T40E, Axiomtek's NANO101 offers cutting-edge graphics performance without sacrificing power saving. Measuring only 120 x 120 mm, it is 50% smaller than the Mini ITX form factor but still offers plenty I/O connectivity. The fully integrated, very low power consumption NANO101 also provides one PCI Express Mini card expansion interface for custom system configurations. It has dual-display capability via 18/24-bit single/dual channel LVDS and VGA connectors. 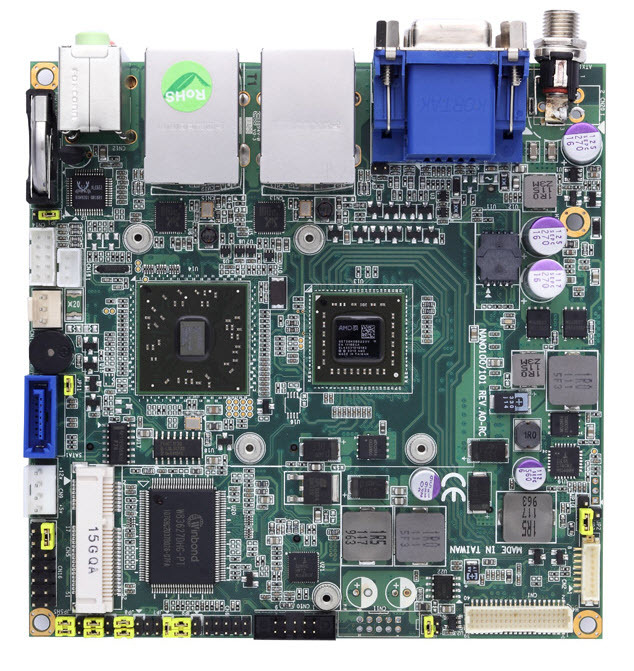 The motherboard is ideally designed for a verity of media centers, smart digital entertainment devices, and many embedded applications. The super compact NANO101 comes with advanced connectivity including six USB 2.0 ports, two COM ports (one is RS-232 and the other is RS-232/422/485 selectable), dual Gigabyte LANs, SATA-600 port, mainstream CFast socket, PCI Express Mini card expansion, and HD audio. The built-in Watchdog Timer keeps system running smoothly. Additionally, the NANO101 supports operation system like Windows 7, Windows XP embedded and Linux.